Relax at scenic Sand Harbor State Park as the Lake Tahoe Shakespeare Festival 2013 season kicks off with the production of Shakespeare’s A Midsummer Night’s Dream, directed by Charles Fee. This magical comedy is full of mischievous fairies, cases of mistaken identity, and mismatched lovers. The director and cast have given the classic play a new twist with inspiration from the modern influences of a rock ‘n’ roll 1960s London theme. The show starts at 7:30 every Monday, from July 12th to August 25, 2013. Each summer, the Lake Tahoe Shakespeare Festival captivates audiences of all ages at the Warren Edward Trepp Stage in picturesque Sand Harbor State Park. You can even start your evening off with a bottle of wine and a gourmet meal! This popular Lake Tahoe festival should definitely make the top of your list of “Things to Do in Lake Tahoe” this summer. 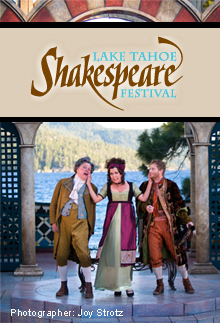 For more details about this year’s production, ticket info, and show times, see the Lake Tahoe Shakespeare Festival 2013 website or call (800) 74-SHOWS. Looking for other great Lake Tahoe events? Check out our calendar of events for a full run-down of all the exciting entertainment happening at Lake Tahoe.